Few months ago, Samsung Internet browser was made available to some Android devices but today, the version 6.2 beta has been released to for all Android 5.0+ (Lollipop+) Smartphones and above. 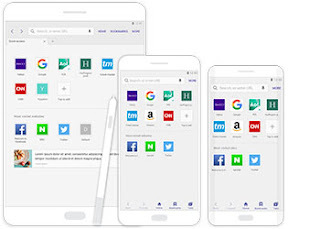 This Samsung Internet browser, v6.2 beta adds a lot of new features. The most notable of these is the high contrast mode, which enables for easier reading for visually impaired people (and is a separate option from the existing night mode). But alongside, there's an upgrade to a new, snappier version of the Chromium rendering engine, as well as several more experimental features like WebVR support for Google Cardboard and the ability to control Bluetooth devices right from inside the browser.